Jared is looking for a Crypto Analyst role within a larger organization, ideally a Crypto Hedge Fund. He brings to the table Digital Marketing Strategist experience after running his own company (Web Marketing LLC) along with experience investing in many coins and tokens since 2014. Jared is an expert in Peer to Peer Lending and has invested in Pre-IPO companies as well as the Stock Market. He is talented at finding creative solutions in the alternative investment space and capitalizing on found opportunities. Jared also has a Finance Degree from Northeastern University, having graduated in 2009 with honors. He has worked previously in the Portfolio Administration function at BlackRock, Inc. Please contact him via Linkedin with opportunities: https://www.linkedin.com/in/jaredschlar/ He can also receive messages at 1.203.548.7736. For sale now ChainDeathSpiral.com. No Reserve. Bitcoin and Cryptocurrency domain name for sale. 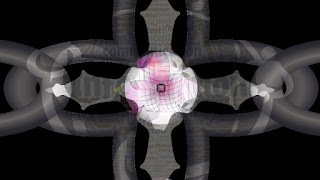 ChainDeathSpiral.com keyword "chain death spiral" means the end of Bitcoin or other cryptocurrencies. This domain would make for a great website about dead crypto coins and tokens. The death spiral occurs when a chain can no longer complete blocks before the difficulty rate adjusts. Also, the domain could relate to a department store chain dying because of disruption from Amazon. If you haven’t noticed most cryptos are highly correlated with the movements of Bitcoin right now. So wherever Bitcoin goes, until something changes, I imagine most other cryptos will go. There is an opportunity to margin trade Bitcoin right now. The way it was explained to me is basically, you could buy small cryptos with what is called in equities as high Beta. Or you could just buy a bigger coin with a lower Beta, take on some leverage and goose your returns with lower risk. Keep in mind, margin trading is incredibly risky. Should Traditional Finance Surrender To Bitcoin? I used to work in the “Bad Finance” industry. And then I left. Why because in my opinion, traditional finance is deeply unconscious. Firms operate solely for the profit motive. Anything that opposes them is something to be destroyed. At the end of college, I started YouBux.com a personal finance portal for young people to help them make better financial decisions that they will live with for the rest of their lives. Interestingly, the verdict from the startup was that people didn’t care enough to make changes. They weren’t in enough pain to make the switch to a more prudent personal financial plan. 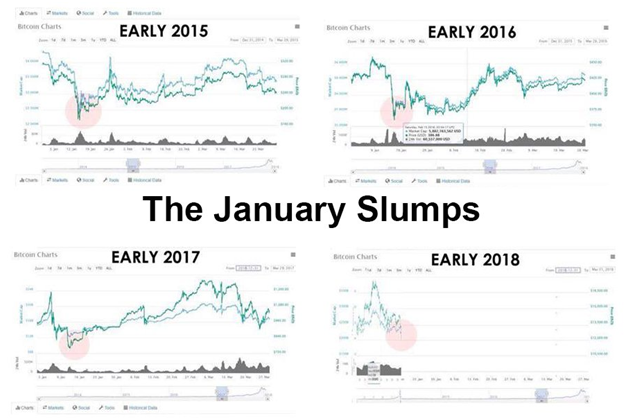 Things start off strong in January, followed by a significant correction. Bearish trend remains until late spring, giving way to a smaller bullish uptick, followed by a flattening off in the summer months. Starting in September, prices begin to rise again, culminating in a bull market every year in November and December. In my best estimate, the price of Bitcoin (BTC) is going down in the short term. Some traders online are saying that the BTC price will hit $8000 once again. I’m waiting for more deals to appear before making new moves. Some facts that are true regarding crypto right now are that social media companies are censoring posts related to crypto. As I mentioned in a previous post, some of the 2017 crypto growth is attributed to social media related to crypto. If censorship by major media continues, it will be harder to educate new users about crypto using these channels and onboard them. Another major marketing point which attracts new users is increases in the price of cryptocurrencies as highlighted by the news. If the price does not move up quickly, then this marketing bullet simply does not work. Bitcoin (BTC) has been in the limelight lately for all the wrong reasons, including its associated risks and some vulnerabilities it has. A few of the most concerning vulnerabilities and issues that BTC faces are related to: problems with difficulty adjustment, the possibility of a Chain Death Spiral, and the ongoing rise in the mempool. In the following sections, we will explore these issues in greater detail. Right at the time of the Bitcoin fork, it became clear that Bitcoin’s protocol has an inherent vulnerability. This is a great video which discusses the future of Bitcoin, Ethereum and ICOs. The most interesting part is at the 1 hour mark where Craig Wright explains some of the future technology which will exist in Bitcoin Cash or does already. I was super impressed after watching it and suggest you do the same. 1GB blocks are not the end goal. Block size will get bigger and bigger over time. Hard forks will become the norm, not shunned. According to Craig Wright in the video, hard forks occurred all the time in early days of Bitcoin. The way you determine if new changes to the software will work is by testing. In the end, the market will decide which coin to value the highest not influencers. Economics still works as long as the data sources are not corrupt. Please watch the video. You will be glad you did. Now that the Bitcoin Segwit2x fork has passed, Coinbase has unlocked trading of BTC again. There may be some selling off of Bitcoin (BTC). It is unlikely to get (B2X) coins right now according to Coinbase. BTC - Chain spiral of death.BTC - Severe network congestion.BTC - Civil War with BCH and other contentious groups. Ethereum (ETH) and Bitcoin Cash are looking pretty good right now. Bitcoin Cash (BCH) is currently 25% more profitable to mine then Bitcoin (BTC). It is my understanding that the Bitcoin Segwit2x (B2X) still has a small probability of happening. This is because a faction of miners still believes in it despite the major market players calling it cancelled. This would enable protection for Bitcoin (BTC) owners who are susceptible to chain spiral of death due to Bitcoin Cash (BCH). 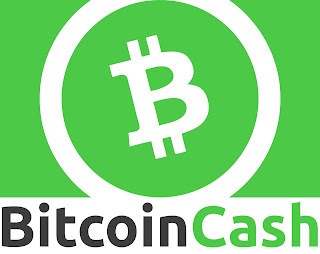 Since BTC has no Emergency Difficulty Adjustment, if there is another crazy spike in Bitcoin Cash (BCH), which in my opinion is likely, all buyers of Bitcoin (BTC) after the August 1 Bitcoin Cash (BCH) fork have no protection. This is a big deal because many people new to Bitcoin (BTC) may have invested large sums of money with no understanding that it could go to zero. Since Segwit activation on 23 August, the Segwit2X team had endured 2 months of relentless bashing from the small blockers, all the while remaining mostly silent. So what happened between October 26 and November 8? It can't be for the lack of consensus which was the reason given. They already knew there was never going to be consensus. Something unexpected happened, causing them to push the "kill" switch. What was it? Read the full article at the above link. Is the Bitcoin Cash flippening happening right now? As of this posting, Bitcoin Cash (BCH) is up about 42% in the last 24 hours. Most other cryptos are down for the day. I don’t see the upside to holding BTC until the cancelled fork news gets baked into the price. Some people on Twitter are calling this the BTC death spiral. The BTC mempool is really filling up now. Here on Yours, I'm sure I'm preaching to the choir but I didn't into Bitcoin to get rich. Nowadays that seems like what all of the "Bitcoiners" want to do. They're just "hodling" their coins to watch it rise in value. Like stocks. Or perhaps more like tulips. No, when I got into Bitcoin years back, it was because I loved the idea of a digital currency in an ever-more-becoming-digital world. A digital currency where I control my own money, no matter what. Visit link to read full article. In my opinion after extensive research I have determined that only two crypto coins or tokens matter until after the Segwit hard fork. This article was previously behind a paywall and is now free. In my paid content you can discover my rationale for this including extensive research I conduct daily. This article is paid and I hope it provides a large value to readers with new insights. My background as a Search Engine Optimization (SEO) Analyst helps me understand indicators about the crypto world that are hard to quantify without the same training. We are living in amazing times right now. This month of November 2017 is one that will go down in the history of Bitcoin as one of the most controversial, most dramatic, most bloody month in cryptocurrency history. Sometime in mid-November is the Segwit2x fork. This is a fork that increases the block size limit of the once heavily-change-resistant Bitcoin from 1mb to 2mb. It has taken over 9 years for this change to occur and the community is nowhere close to reaching a consensus. Read full article for free at the above link. On approximately November 18, Bitcoin will split into two chains: Segwit1x and Segwit2x. Because these chains share the same proof-of-work function (PoW) and neither change the difficulty adjustment algorithm (DAA), it is unlikely that both will survive simultaneously. View the link above to read the full article. In 2013 and 2014, the Bitcoin community was much more united than it is now. Back then, the community's excitement level rose when businesses announced they were going to accept Bitcoin. It was sign of legitimacy taking root when companies such as Microsoft, Overstock, Expedia, and Newegg started accepting Bitcoin - as well as the many other businesses Bitpay, Coinbase, and others brought aboard. The community eagerly awaited for the next big company to start accepting Bitcoin, as one major criticisms at the time was "what good is it if you can't spend it anywhere?" As this was a valid concern, the community consensus was unanimously in favor of accelerating business adoption. What are the Main Drivers Behind Positive Bitcoin Cash Movement? Bitcoin Cash (BCH aka BCC) has been the focus of discussion for many cryptocurrency experts and there are valid reasons for such inquiry. Bitcoin Cash is experiencing significant growth and moving in the right direction right from when the main Bitcoin blockchain hard forked. Let us go through details of how it is performing and also check the reasons which are fueling such positive movement. Yesterday, there has been over 18% improvement in exchange rate (BCH/USD) from the low to the high, helping Bitcoin Cash attain $550.00 level with a network cap of about $9.1 billion. As such, it has reached the top 3rd position of cryptocurrencies by their network cap. I use network cap rather then market cap because it is not an equity and does not have earnings. What is causing the price rise for Bitcoin Cash? There are several content management platforms that content creators can make use of and now there is a new one called Yours.org. So, what is special about it that differentiates it from others and how content creators can benefit by using this platform? Let us look at the answers to these questions in the following sections. Read more about Yours.org and Bitcoin Cash here.